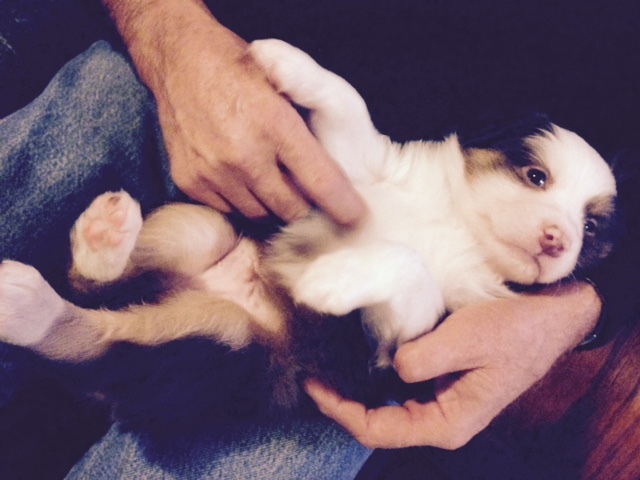 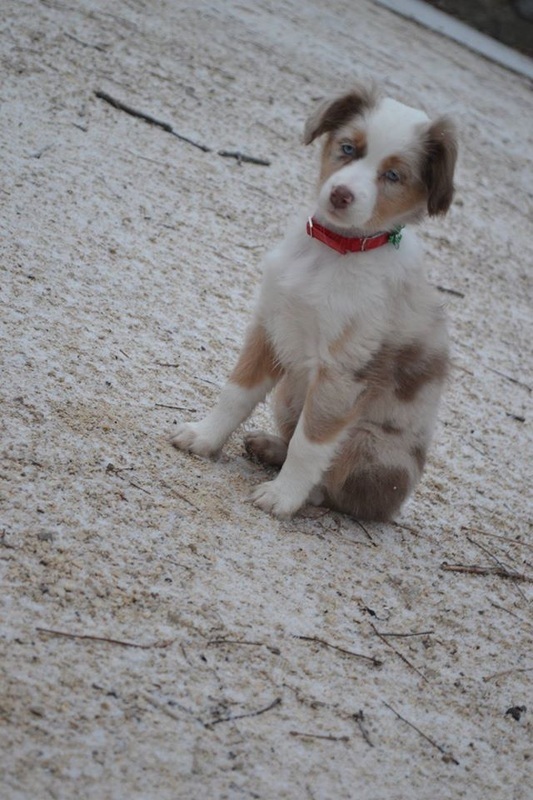 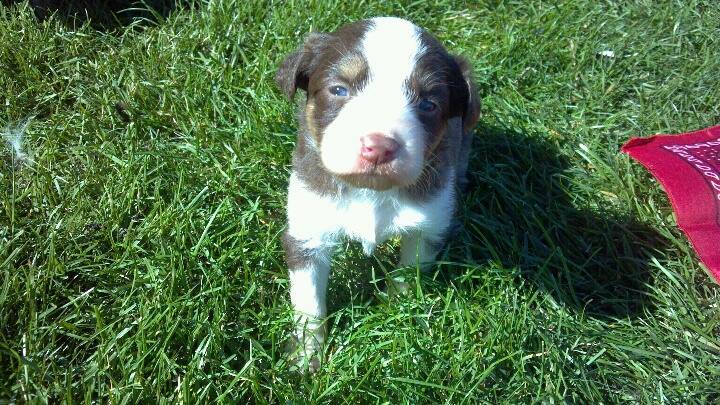 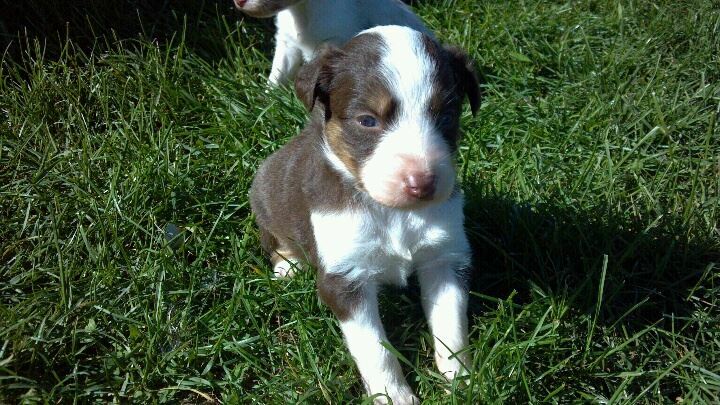 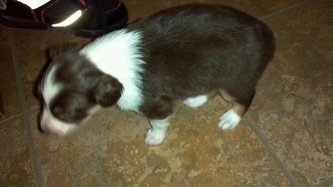 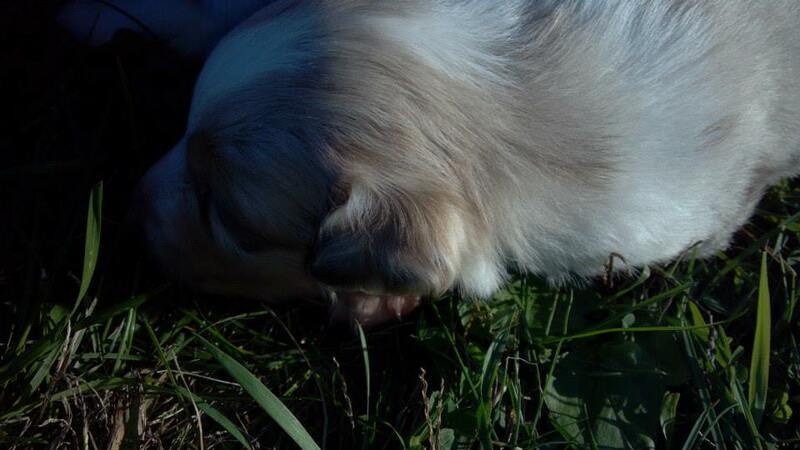 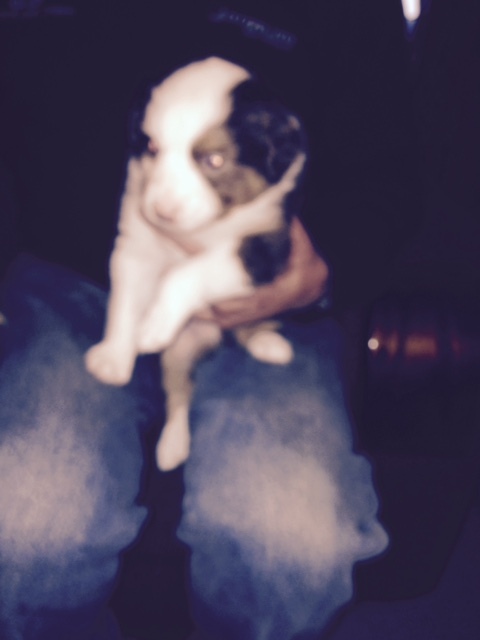 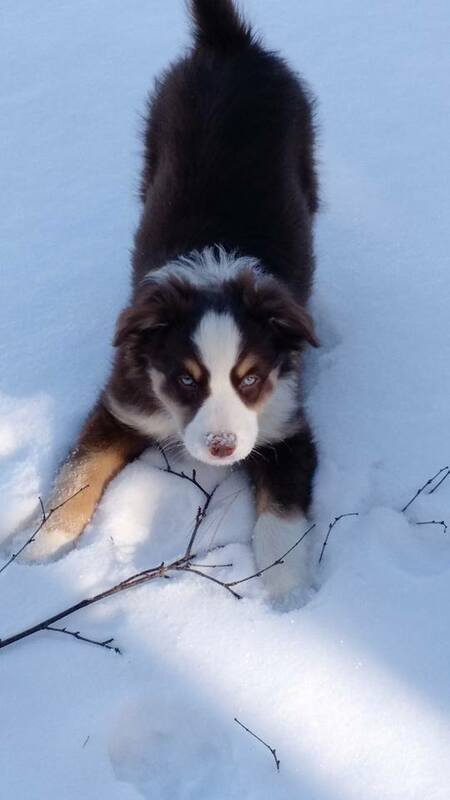 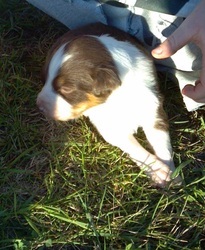 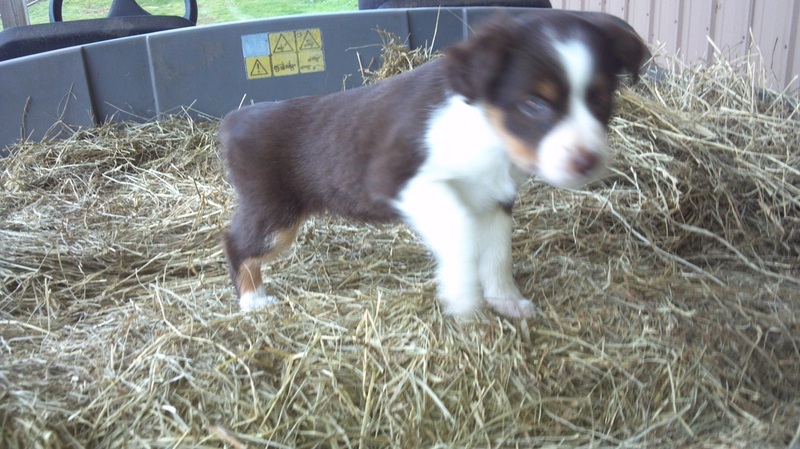 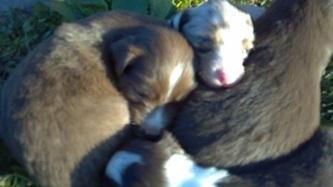 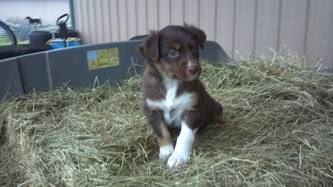 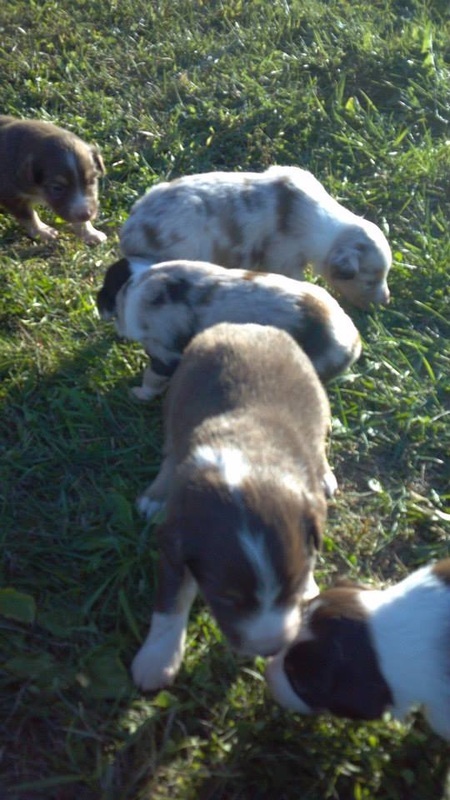 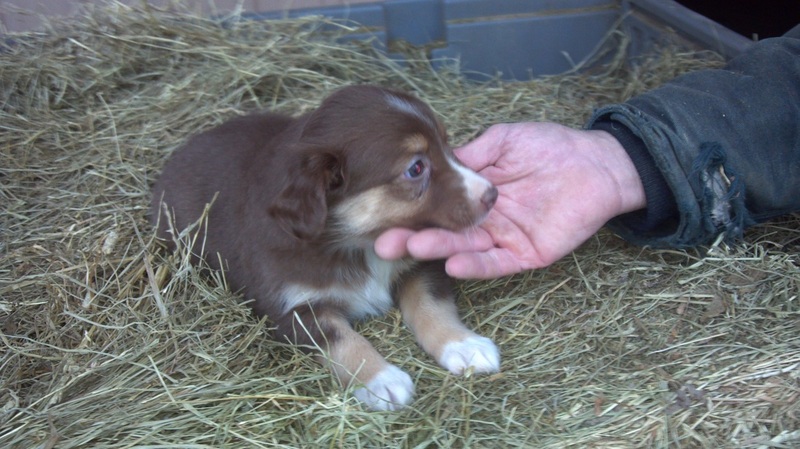 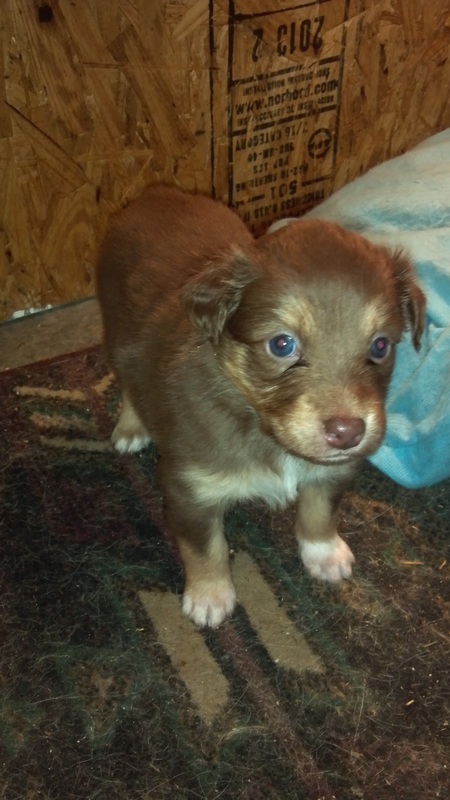 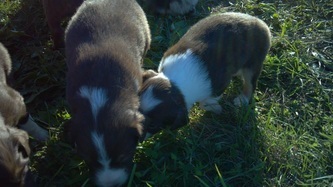 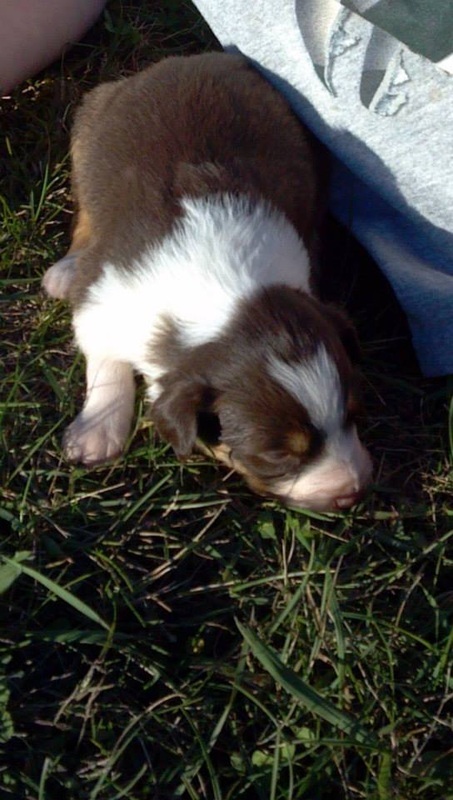 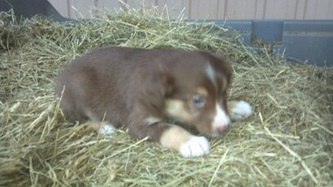 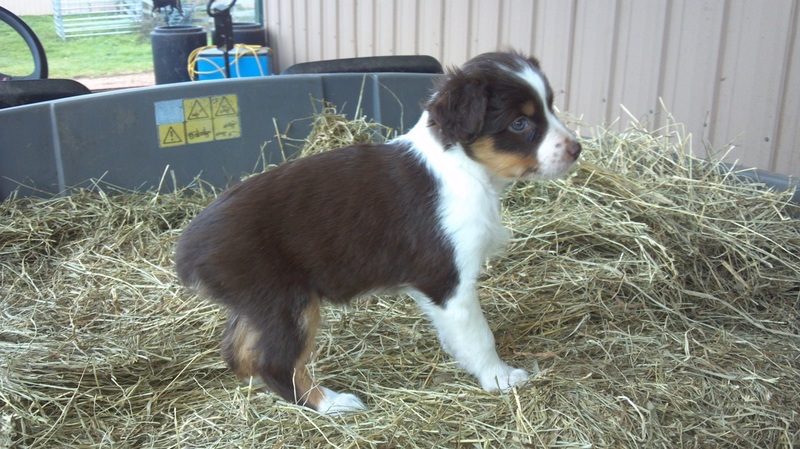 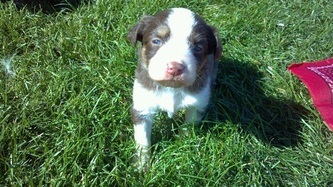 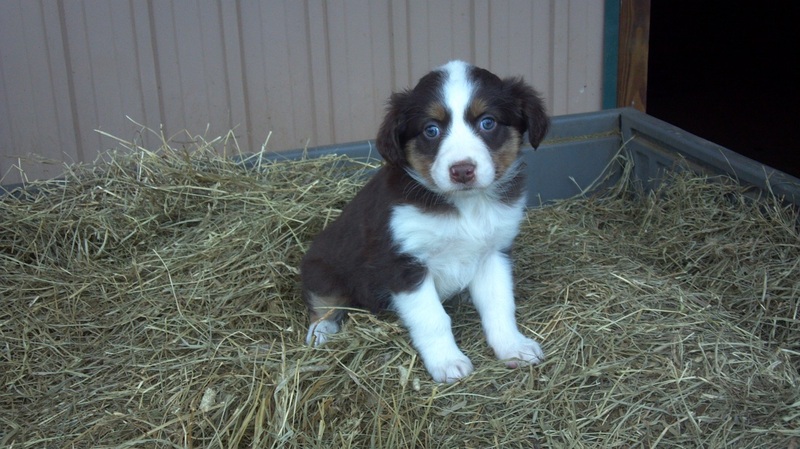 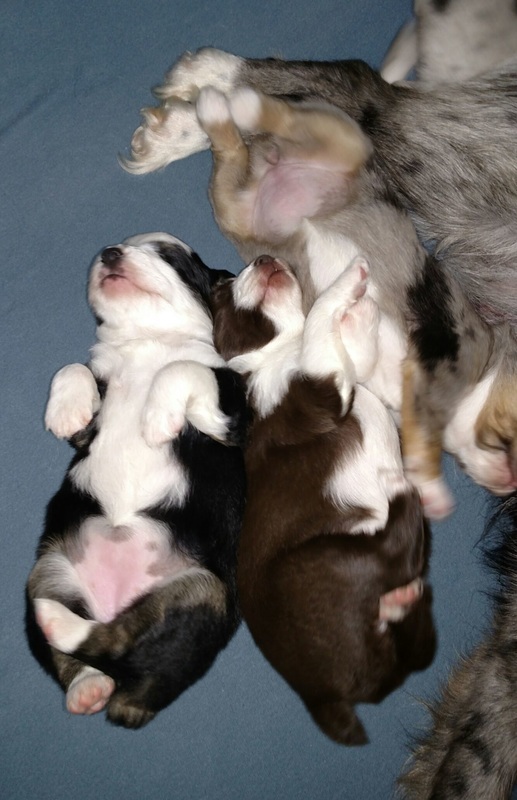 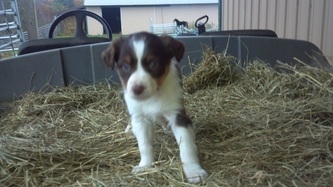 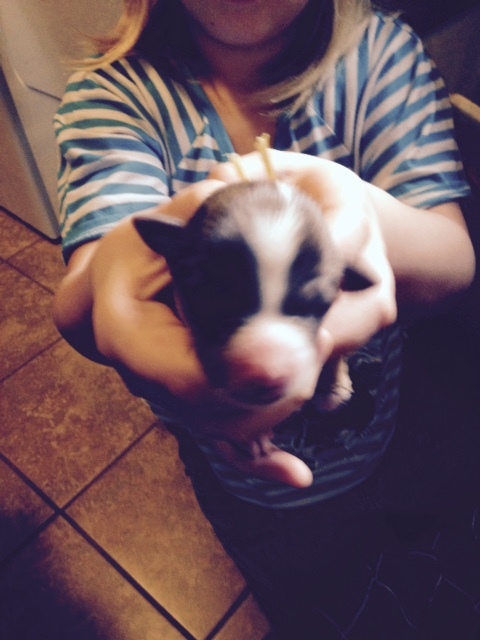 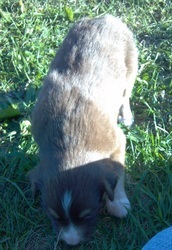 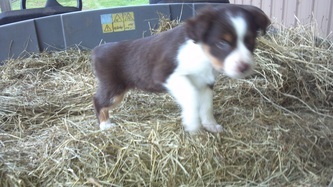 WE CURRENTLY HAVE A LITTER OF STANDARD AUSSIES AVAILABLE. BORN 1/29/19. Red merles, black tris and red tris. 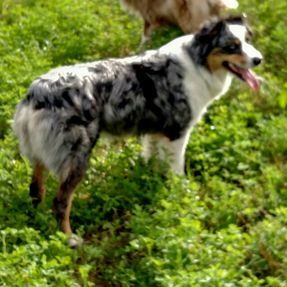 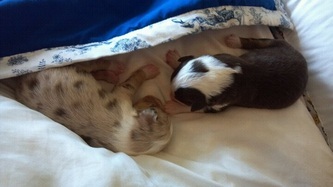 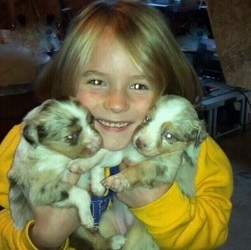 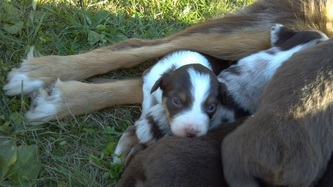 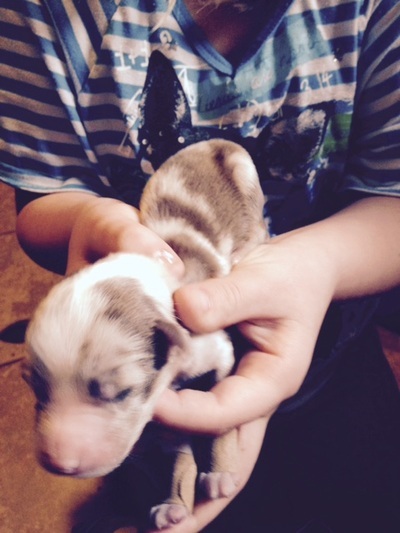 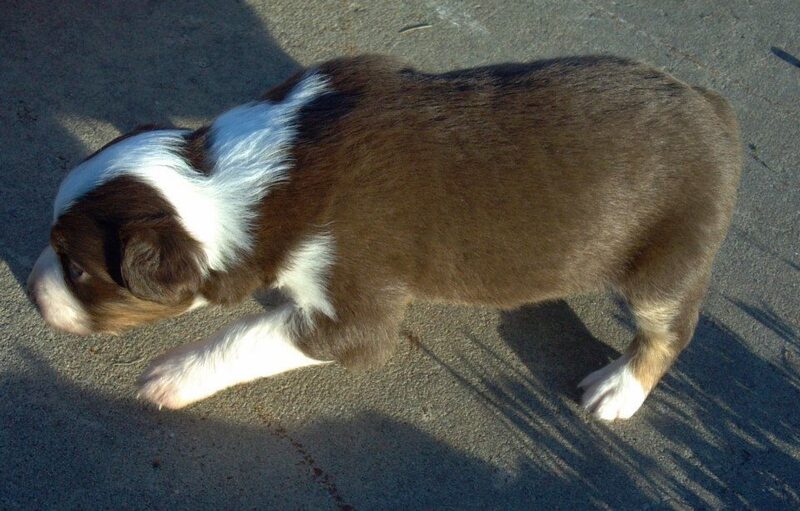 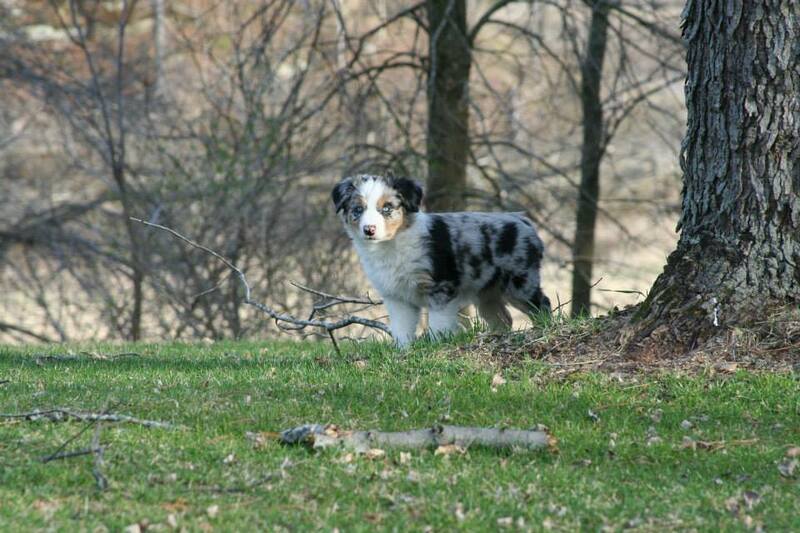 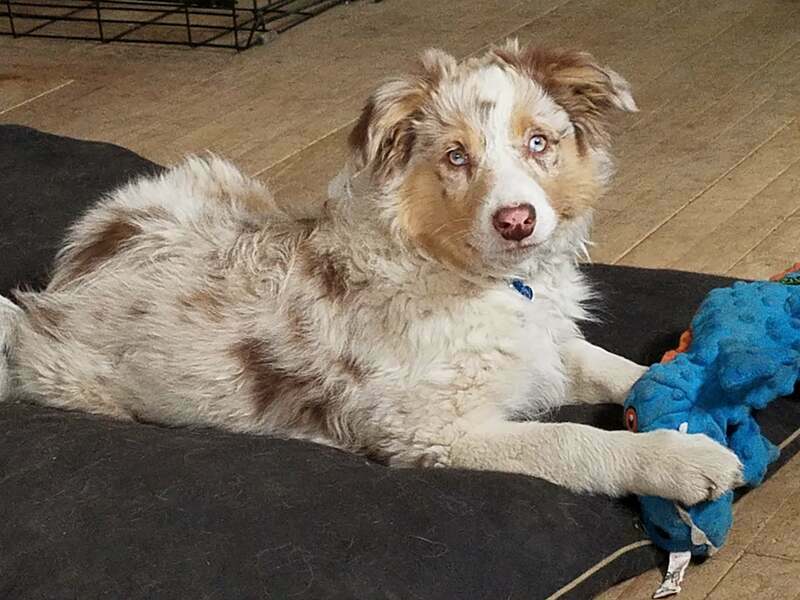 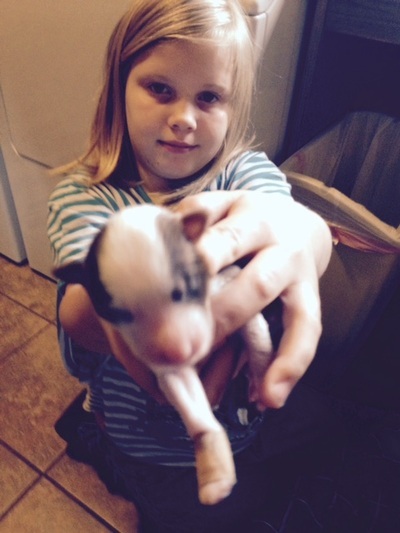 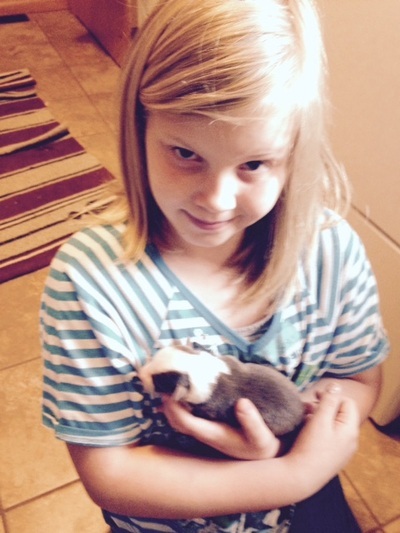 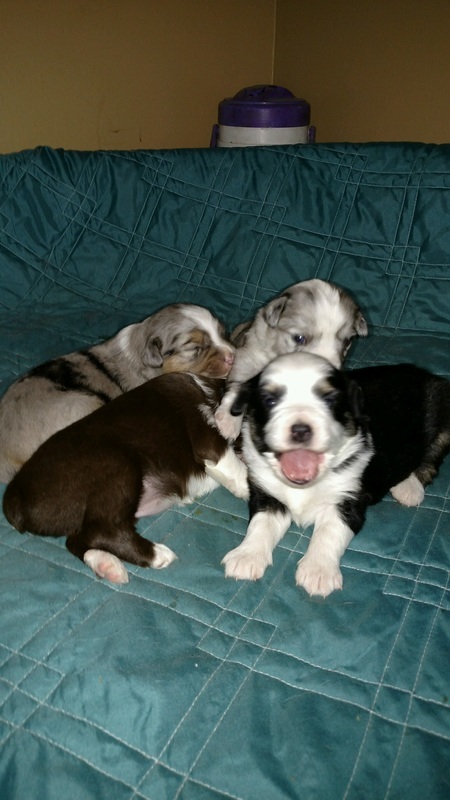 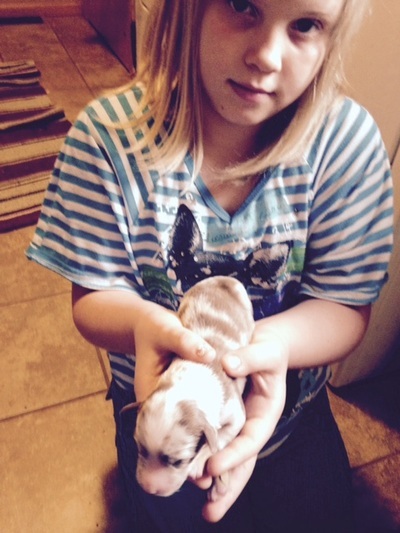 ​Blue Merle with blue eyes and Baby Flo, ASDR pending, Mini Black Tri. 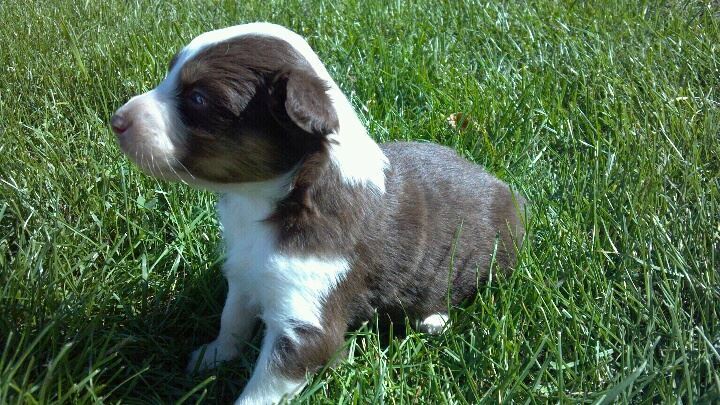 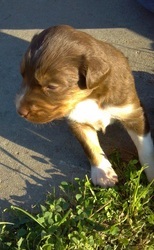 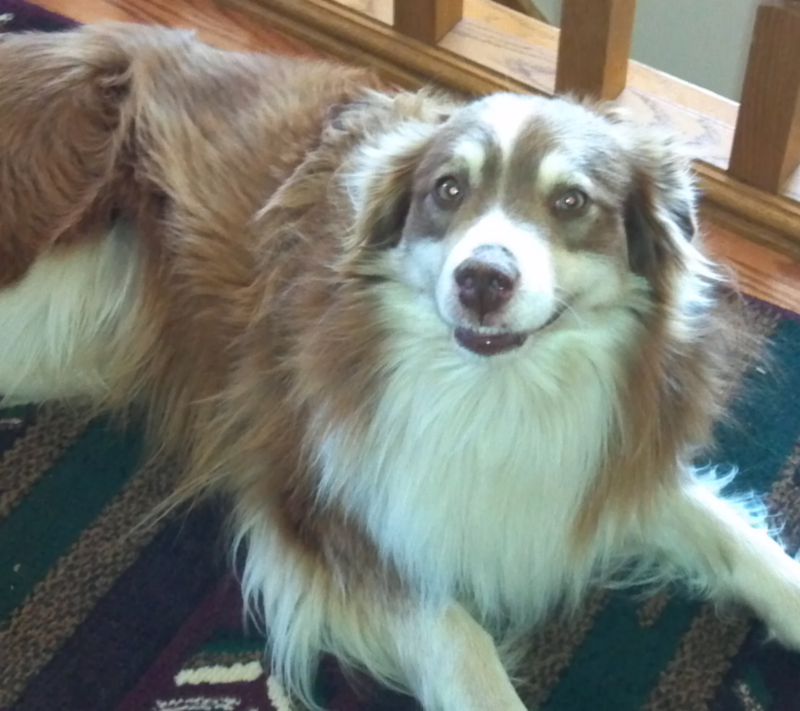 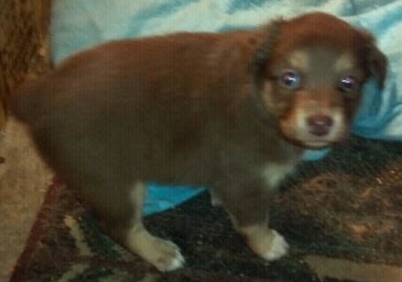 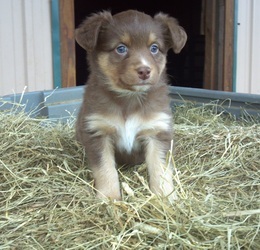 Our sire, SR CHOCOLATE CHIP, ASDR, Red tri, amber eyes. SR Tagas Smooch is 20" tall and weighs in at approximately 49#. 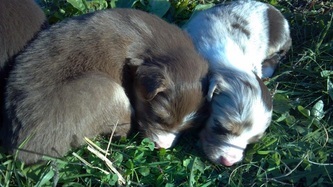 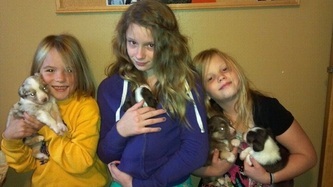 Pictured above - the three pictures are a standard puppy out of Smooch and sired by Chip. 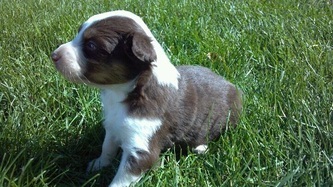 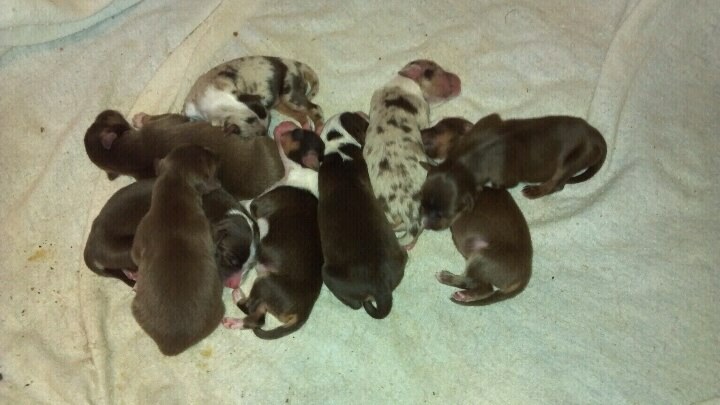 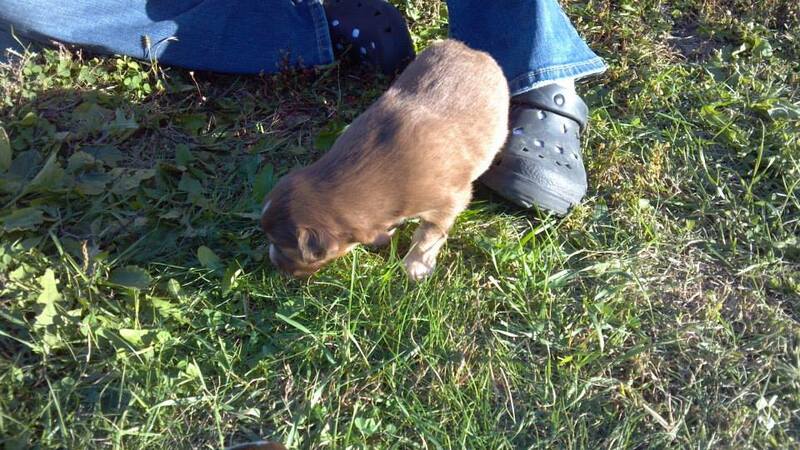 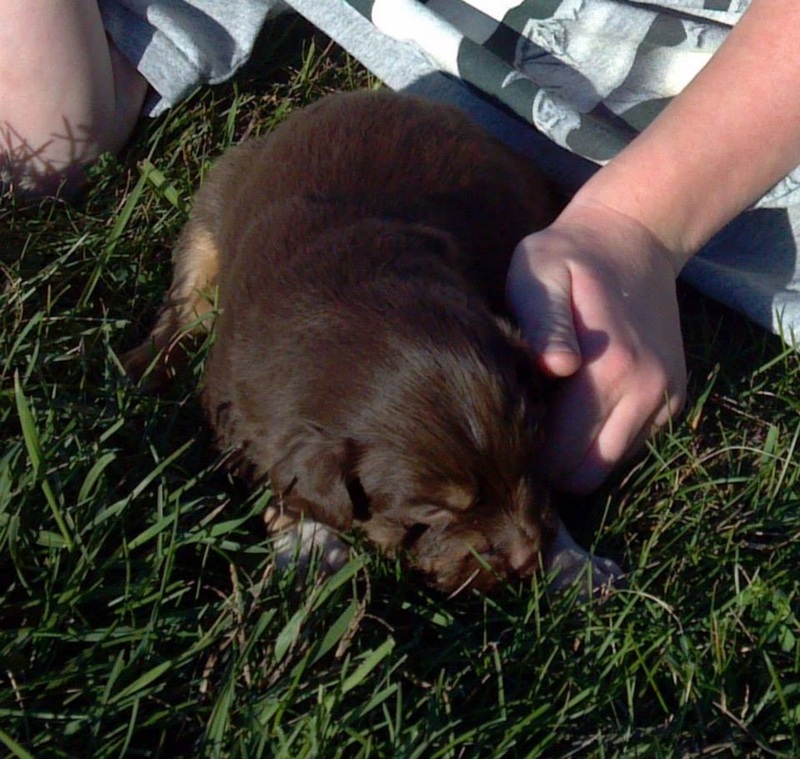 Pup Sired by SR Chocolate Chip out of SR Tagas Smooch, 8 weeks old. 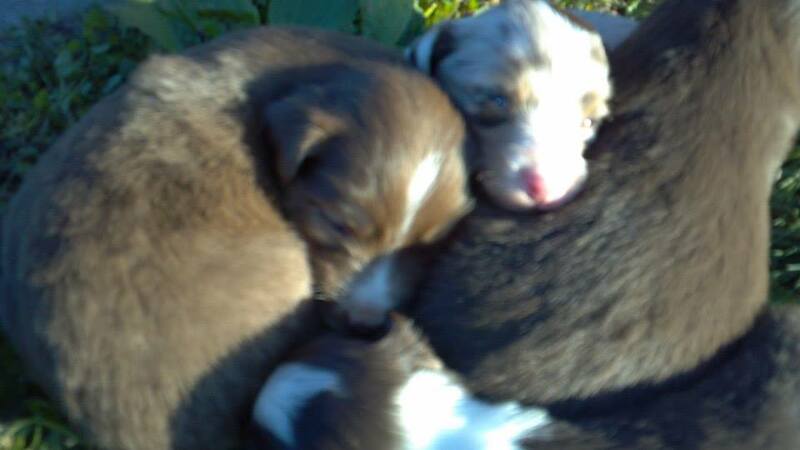 Out of their first litter. 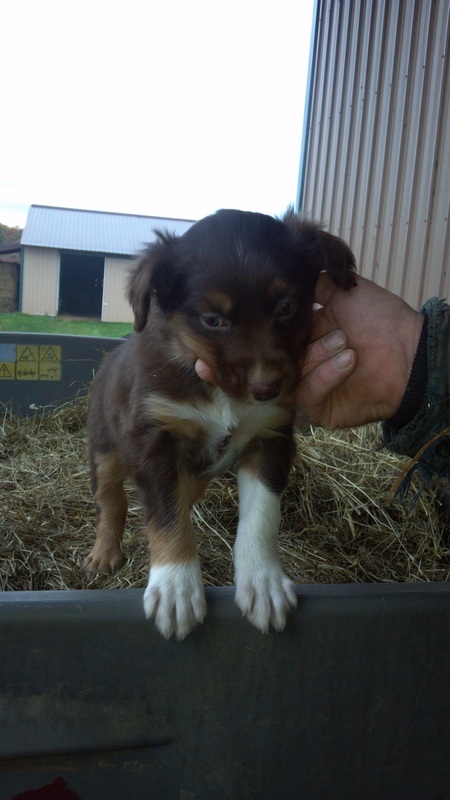 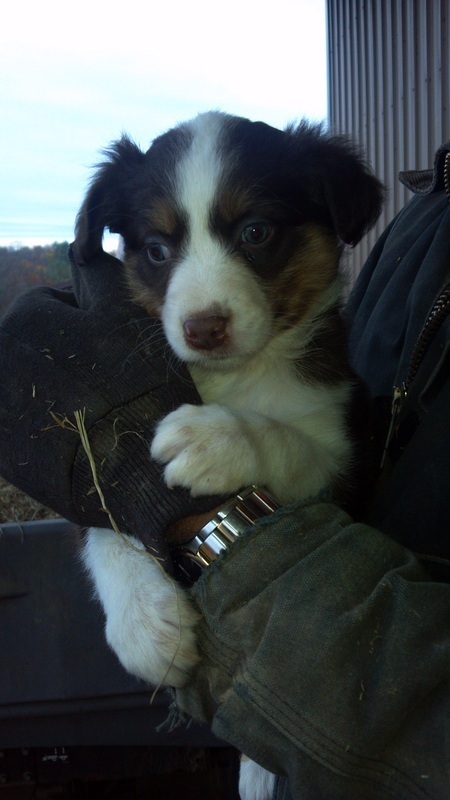 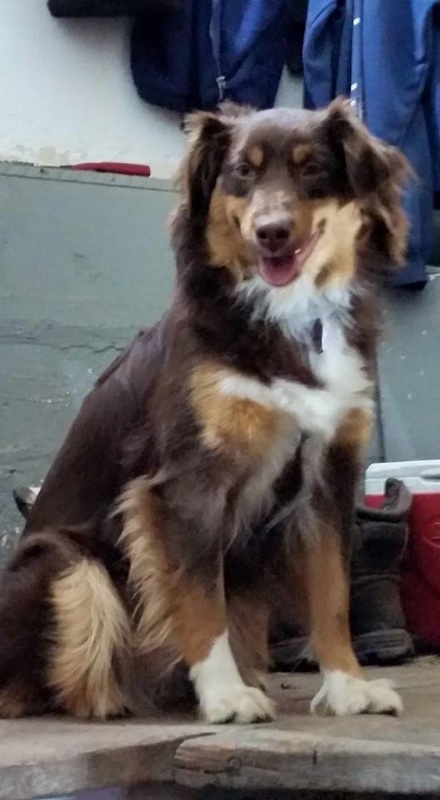 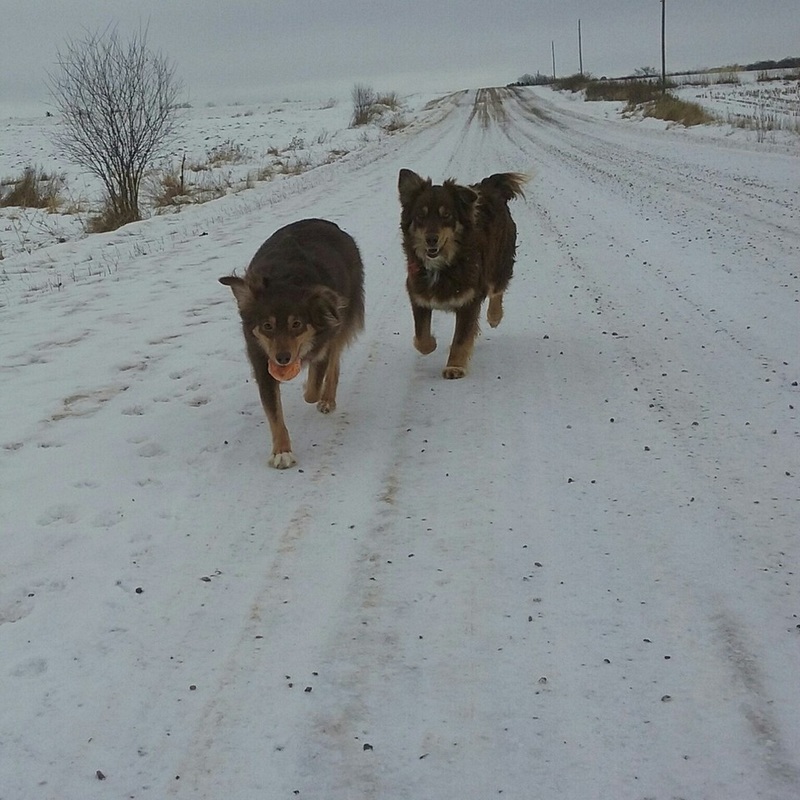 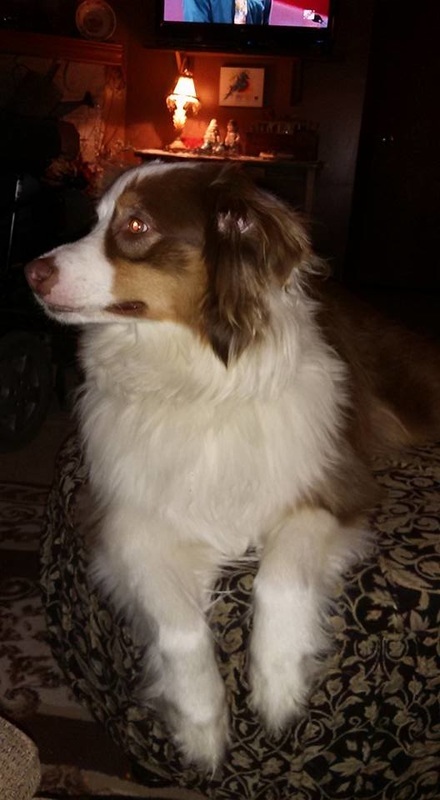 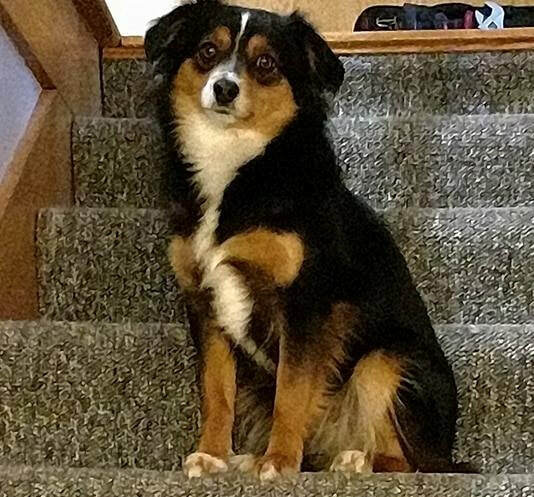 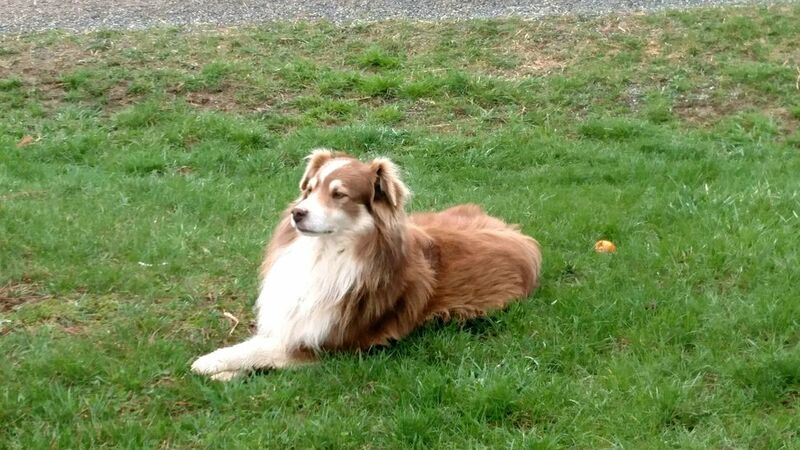 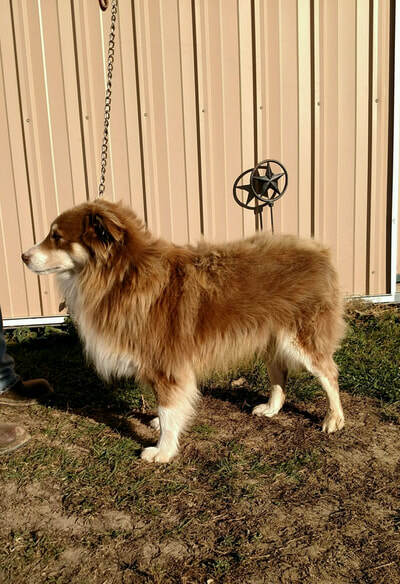 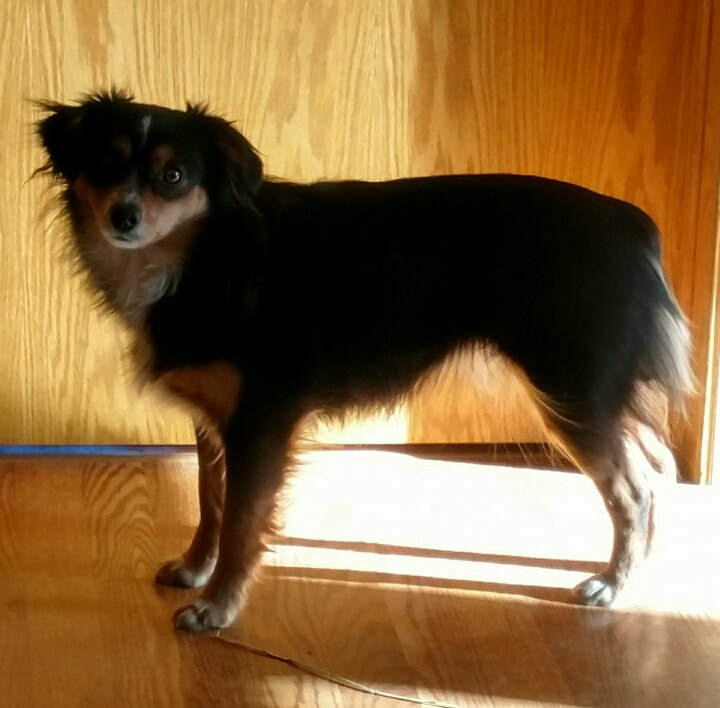 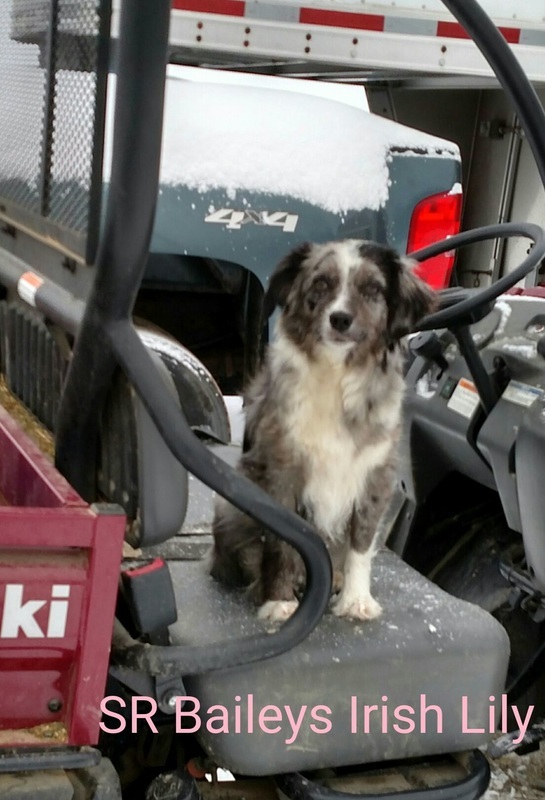 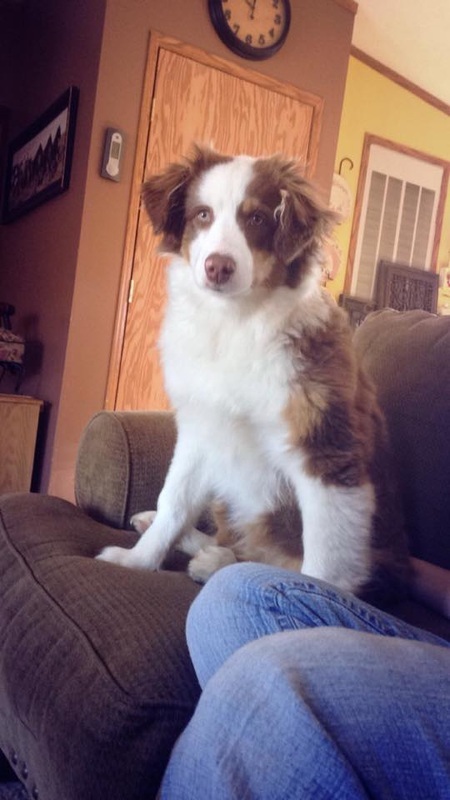 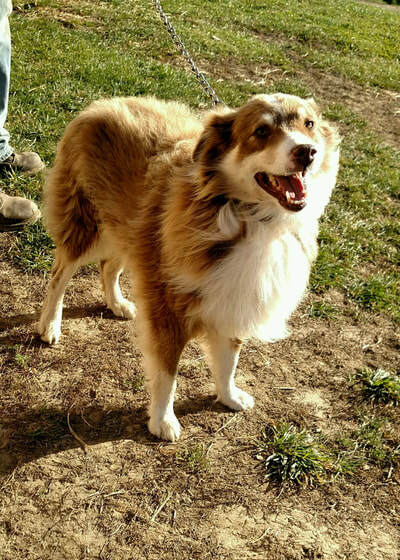 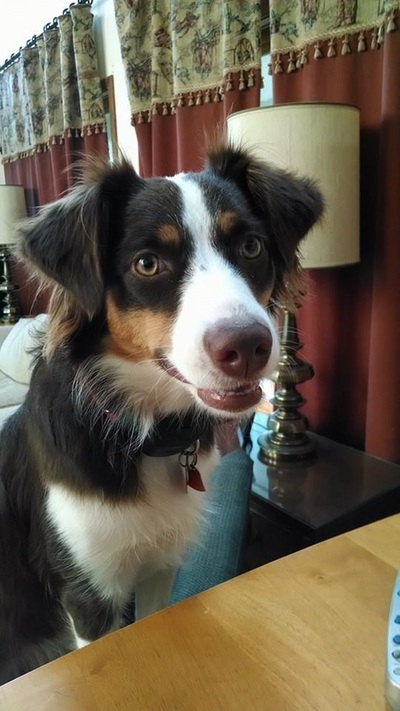 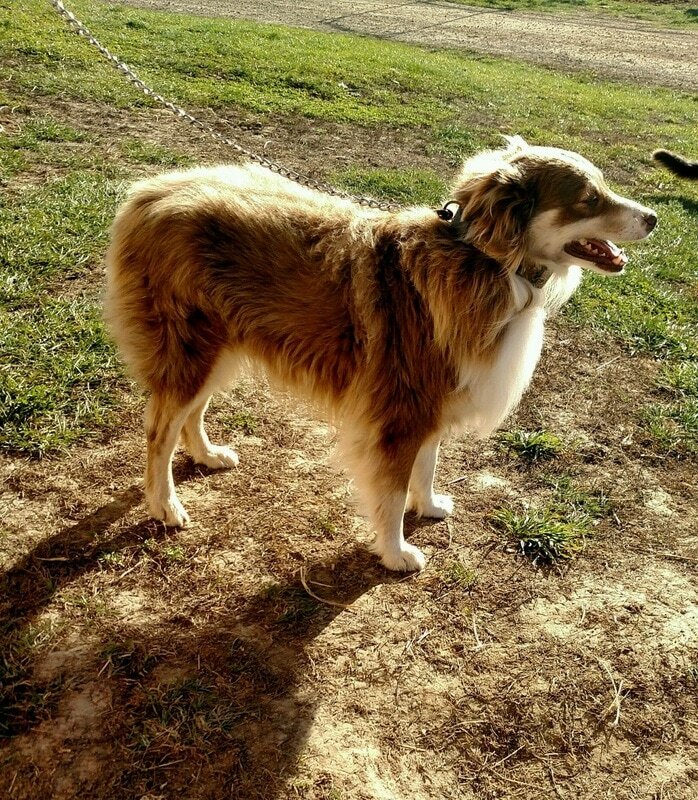 Both parents are extremely sweet dogs and will work stock when asked. 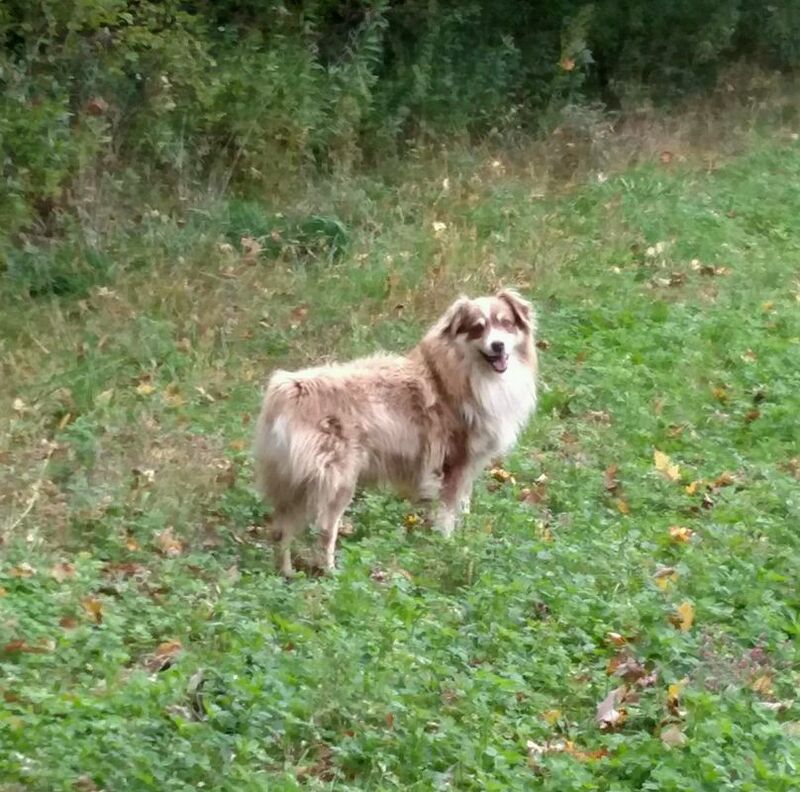 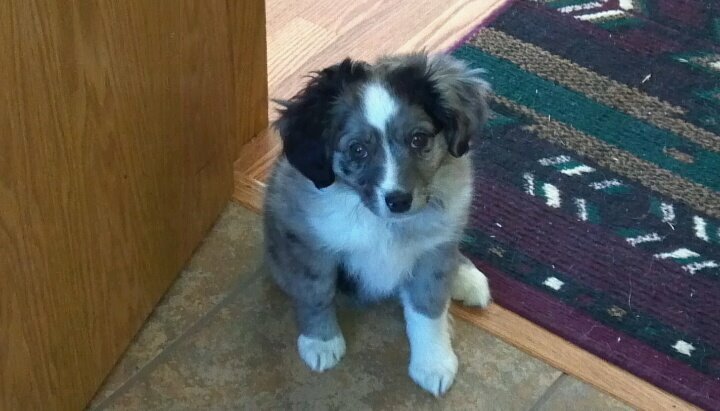 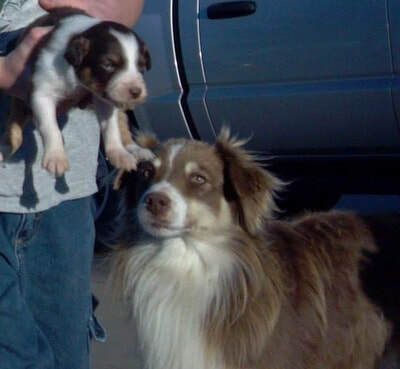 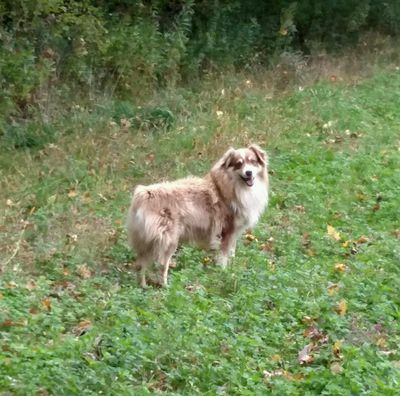 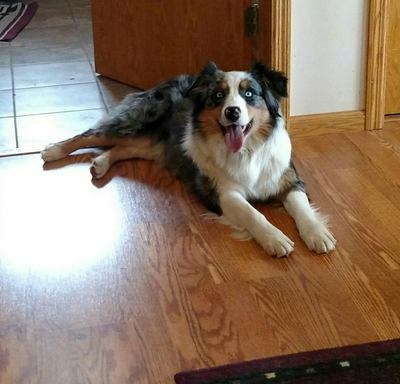 Mother is a blue merle BI, Father is a Red TRI. 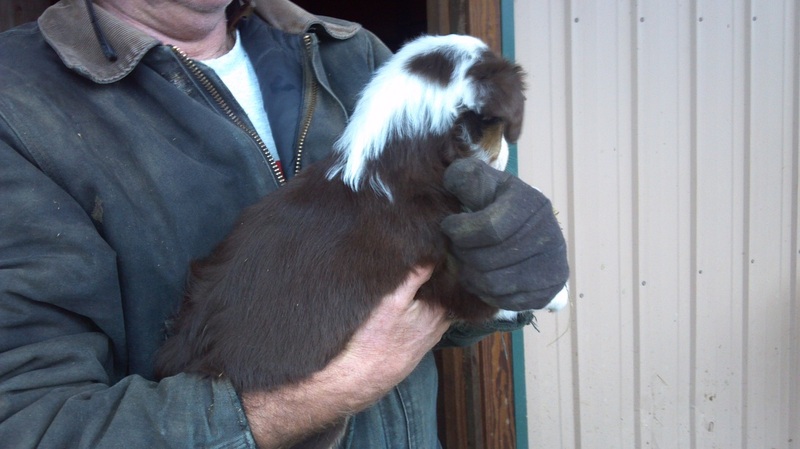 Dad weighs approximately 45# and is approximately 20.5" tall. 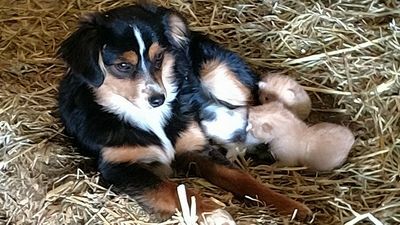 Mother weighs 12#, and is approximately 14" tall. 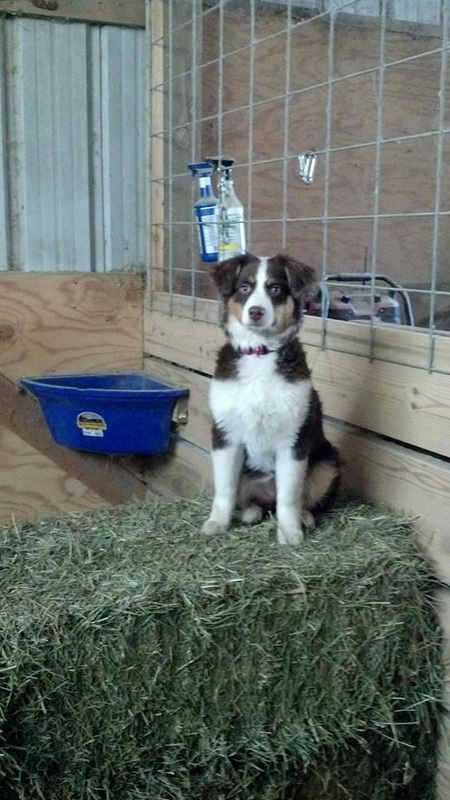 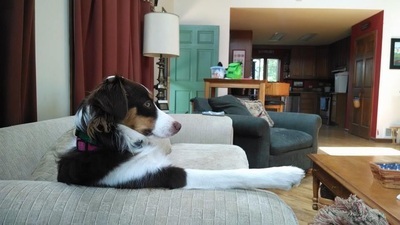 Her dam is excelling in agility classes. 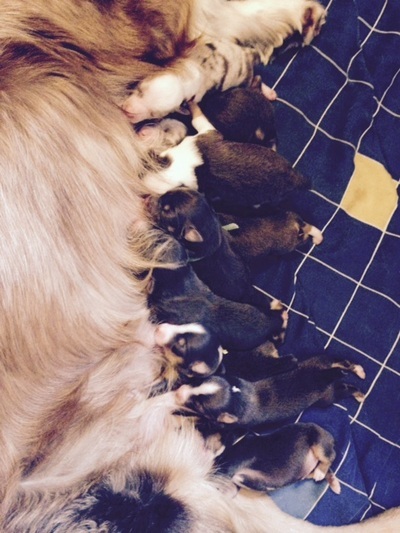 Parents are pictured directly below with their new litter. 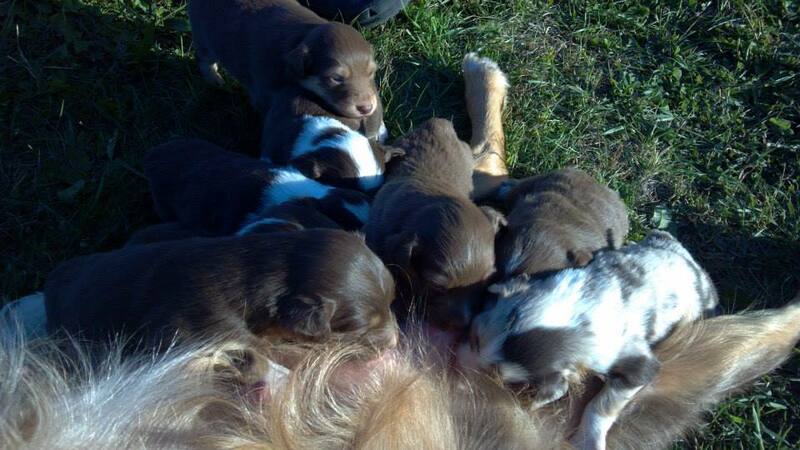 THIS LITTER HAS BEEN SOLD. 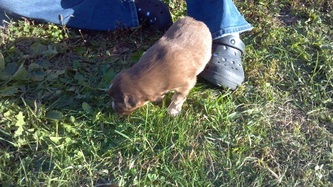 Willow, owned by the Susong family. 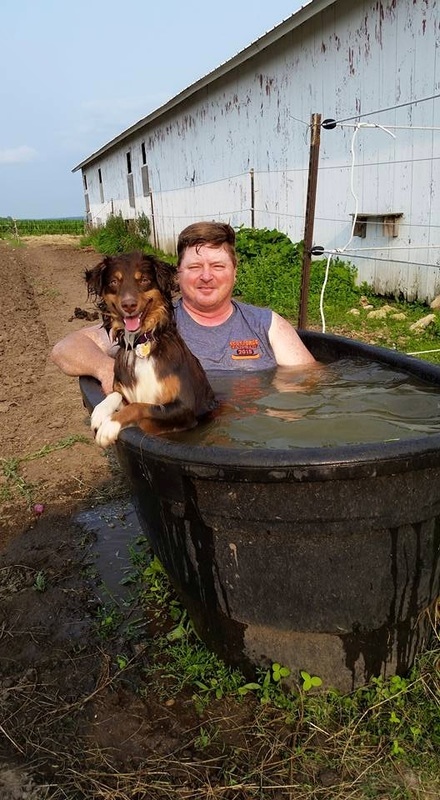 You ask: "Do Aussies like water?" 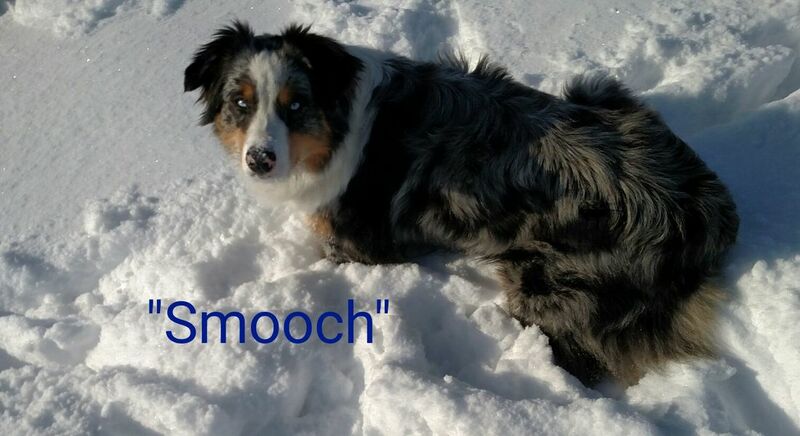 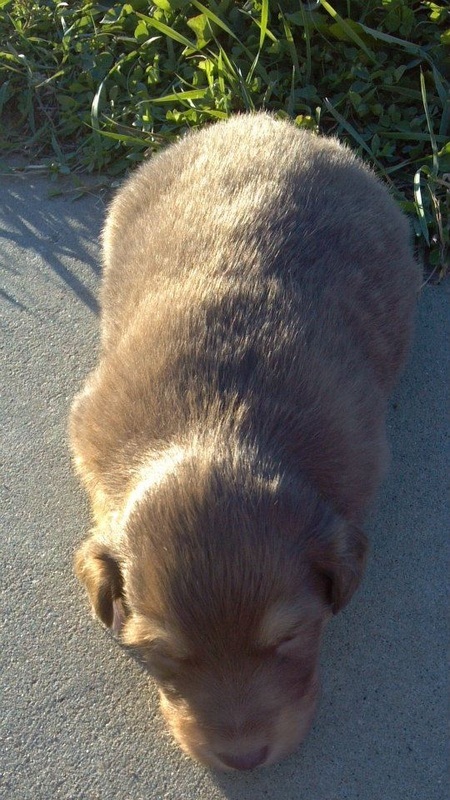 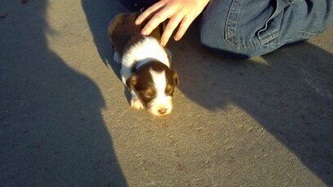 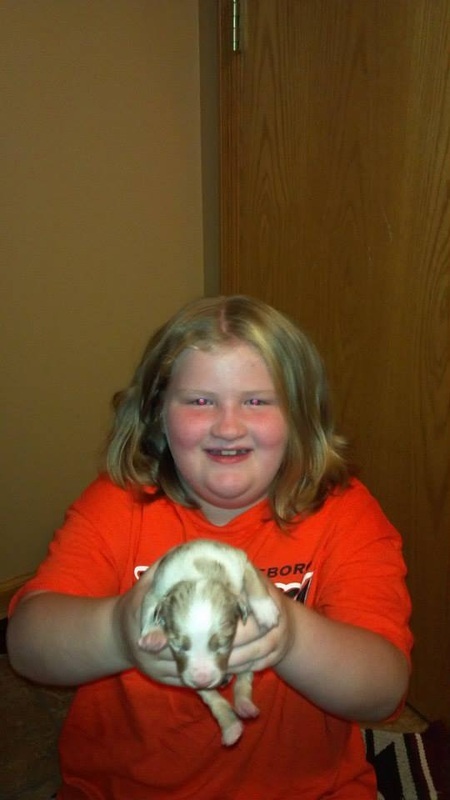 Smooch pictured as a pup! 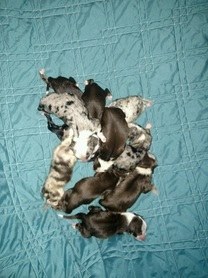 Full siblings out of two different litters. 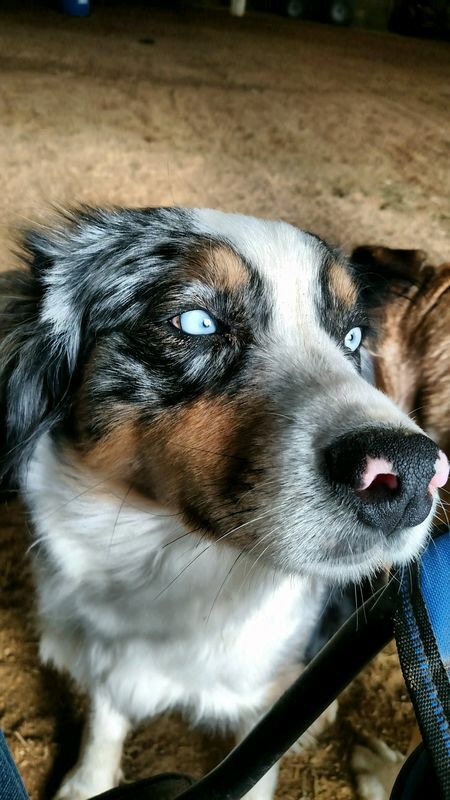 (Chip x Missy) These two met at a doggie day care! 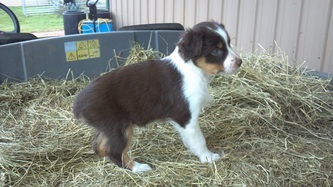 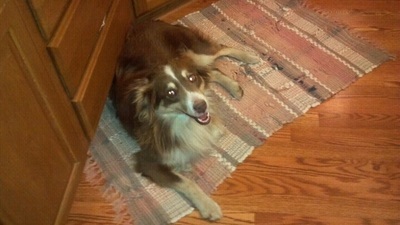 Another photo of Bugsley owned by Pam and Dave Reynolds. "I would only get one from this family! Great disposition! Smart puppies!" 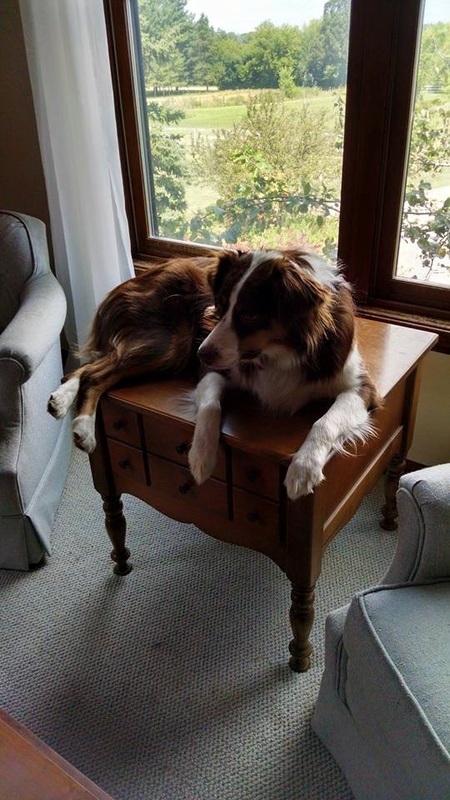 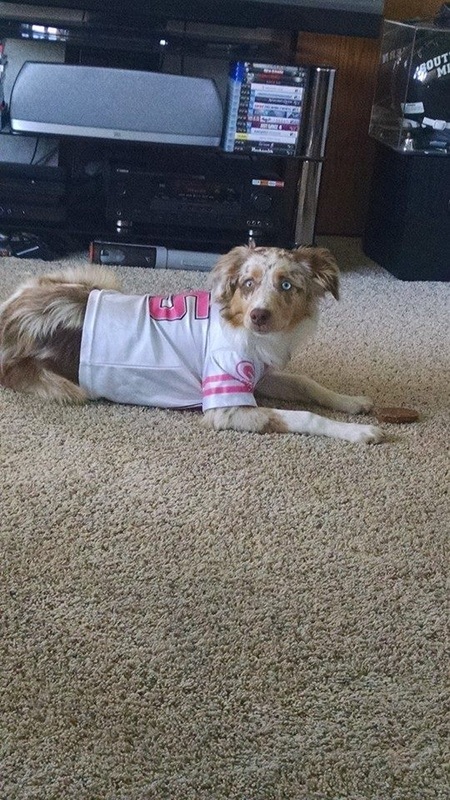 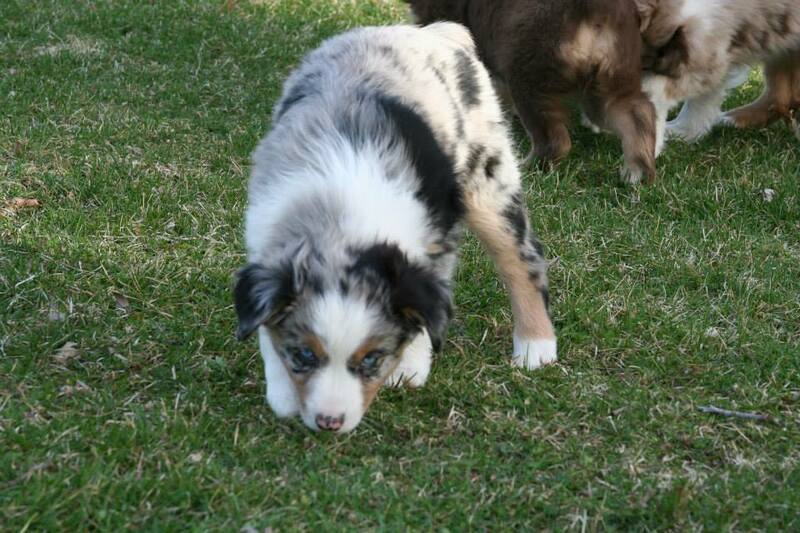 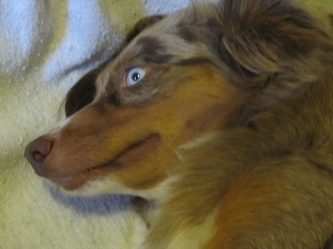 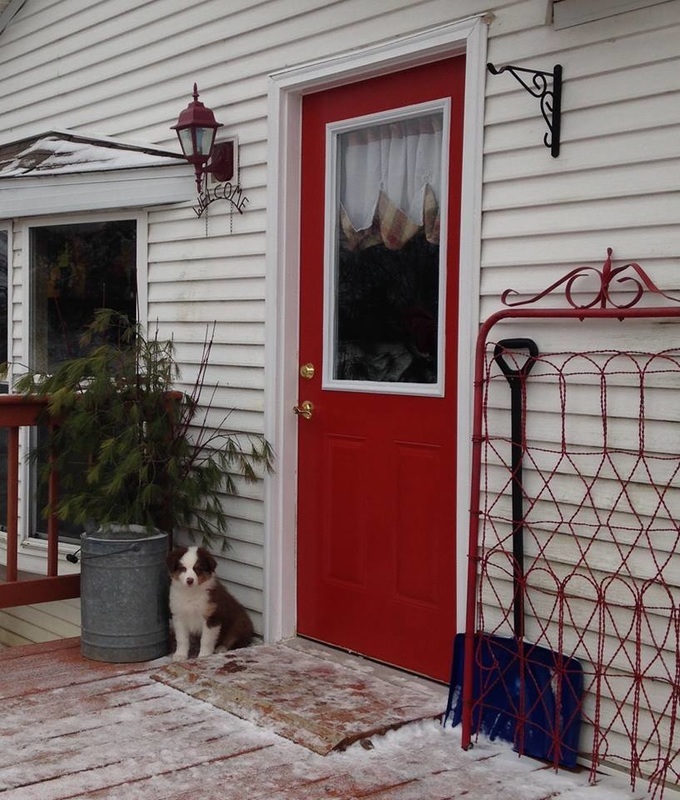 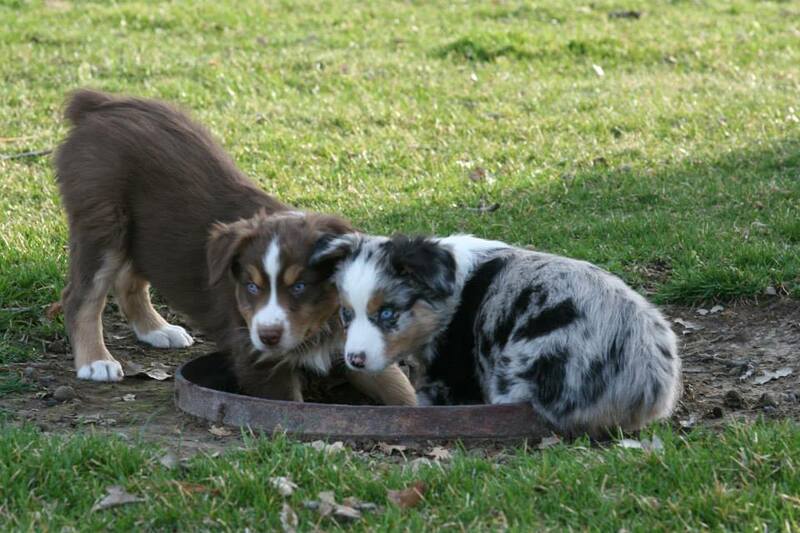 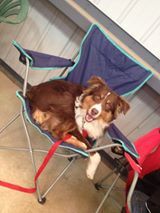 "I want a blue merle to go with my red tri from you : best puppy EVER!" "Would highly recommend one of your pups! 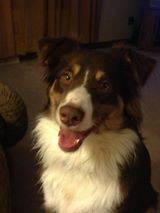 We love our boy Jack... 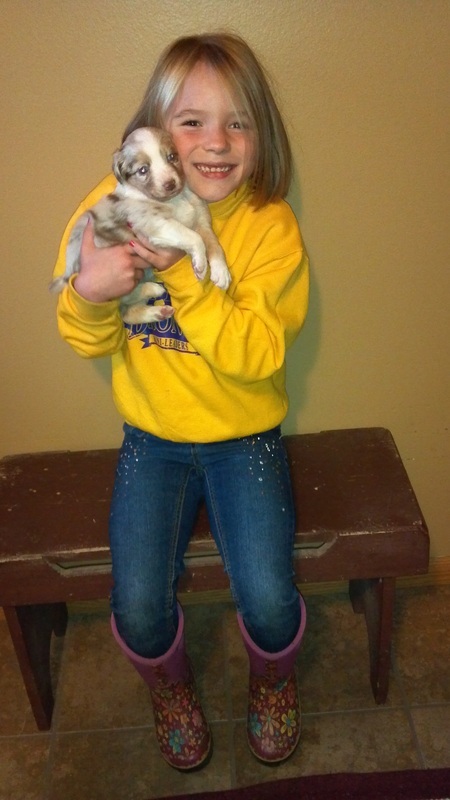 He's great with kids & really wants to please- even the vet fell in love with him!!" "Sky was our son's 15th birthday present. 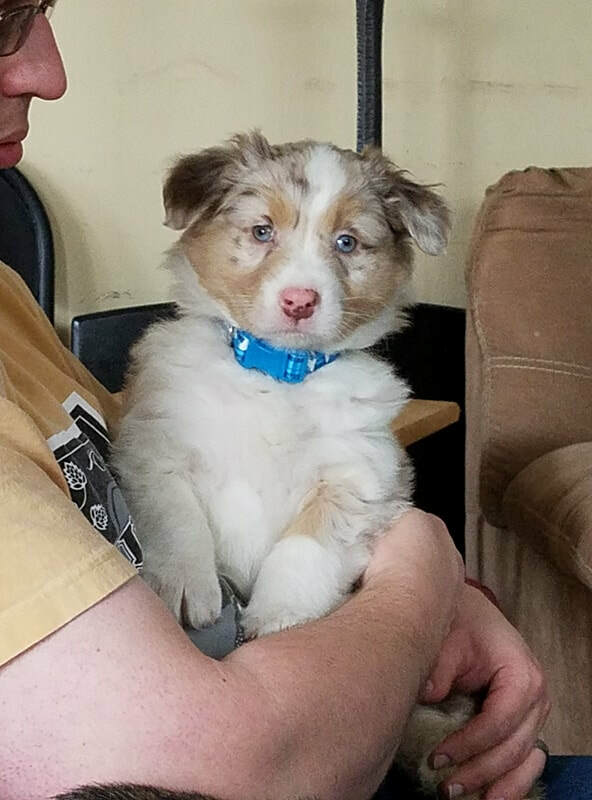 We picked her up May 10th. 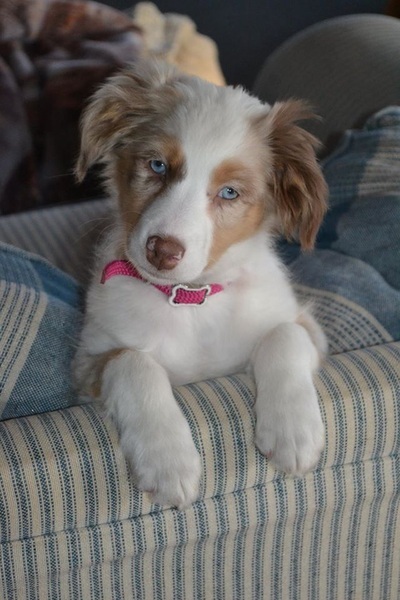 She is gorgeous and extremely intelligent! 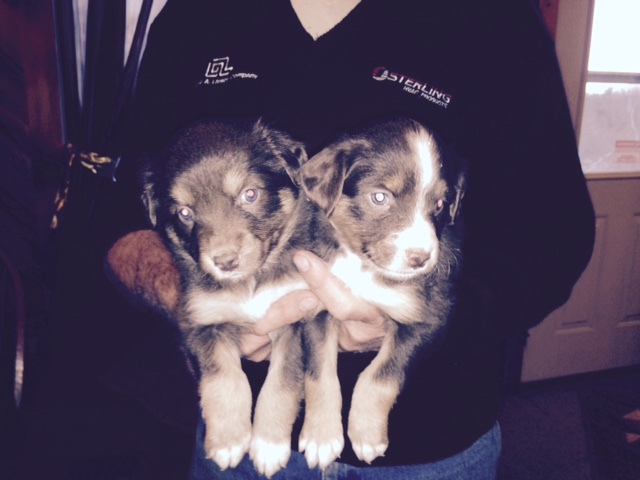 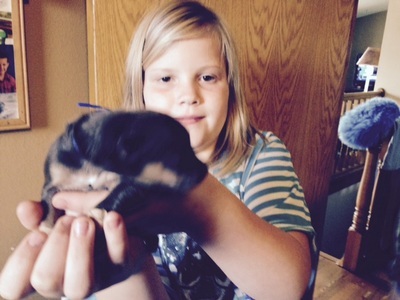 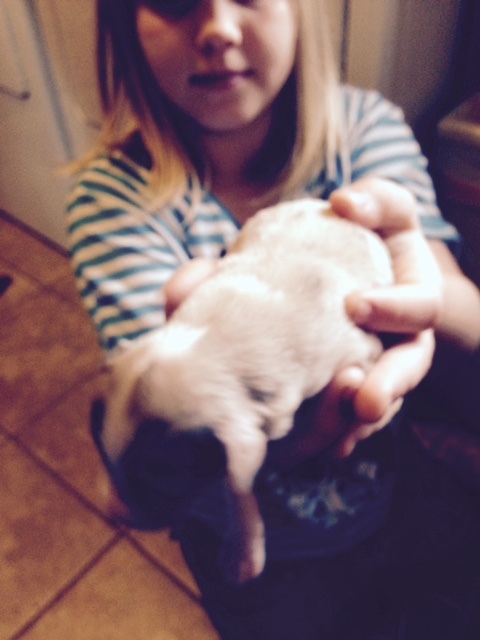 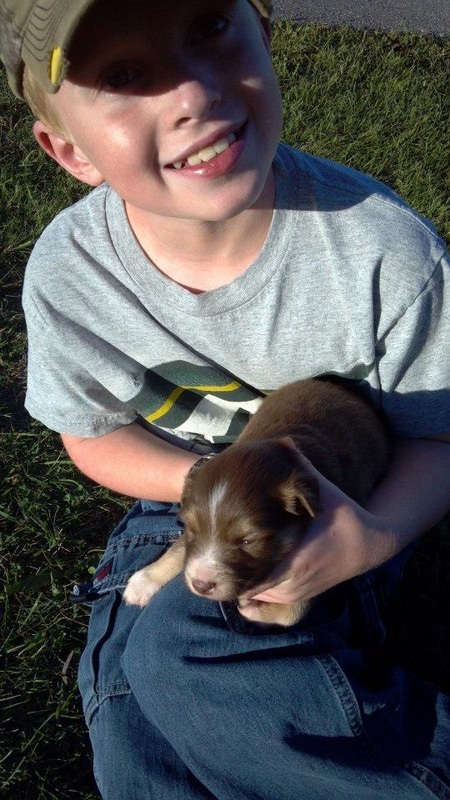 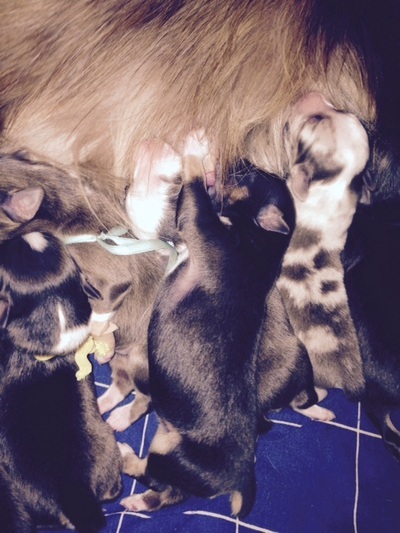 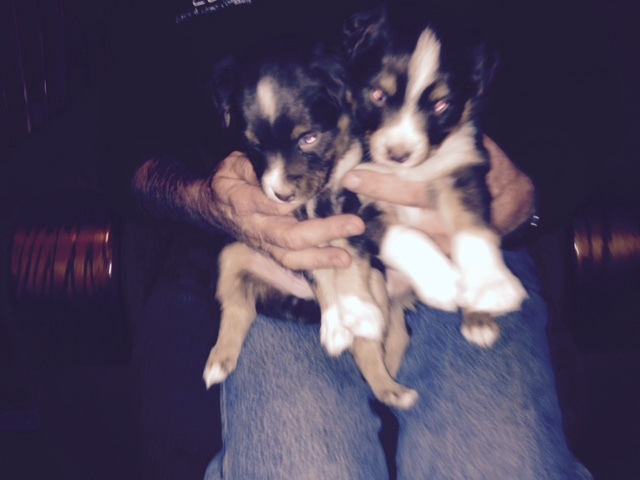 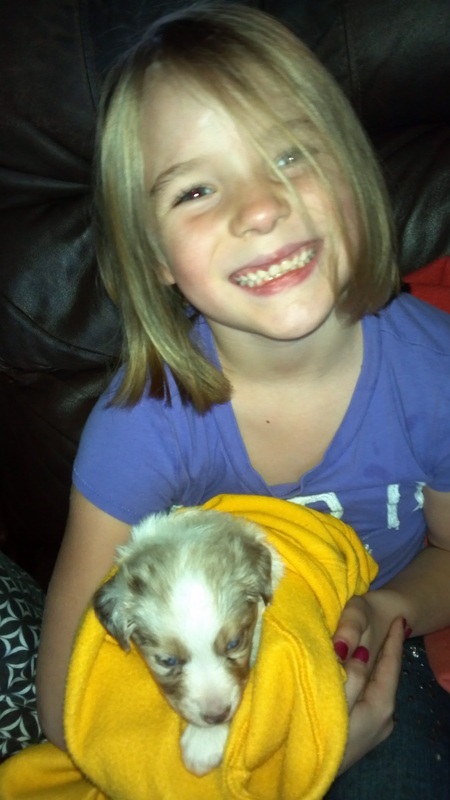 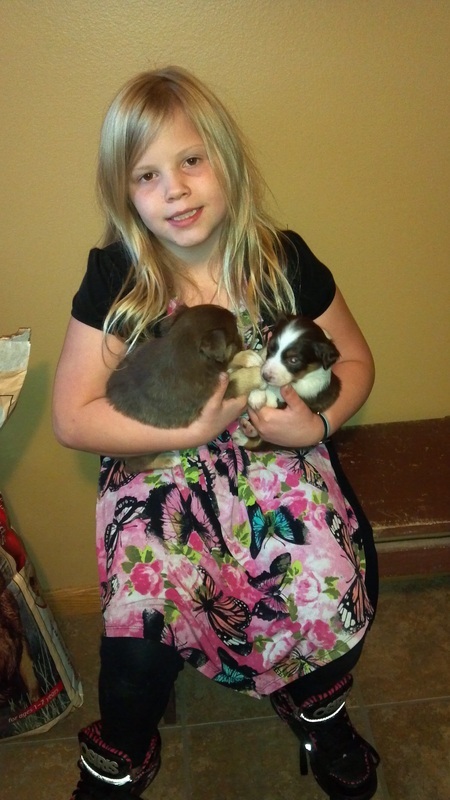 Thank you -Brenda Bambrough-Pfaff for such awesome puppies!" 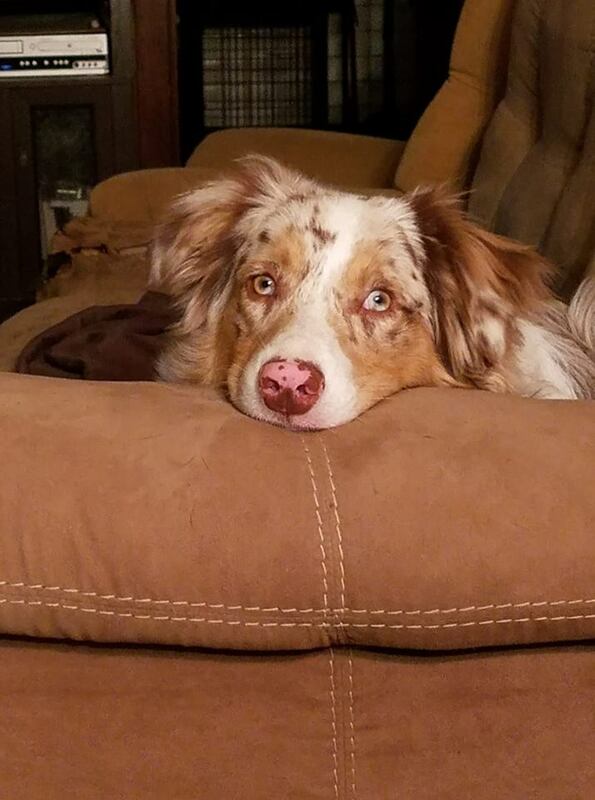 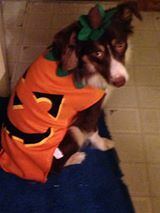 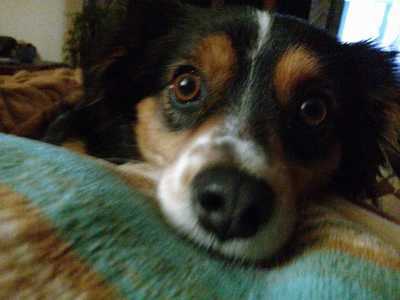 "...Wouldn't trade our Willow for the world!!" 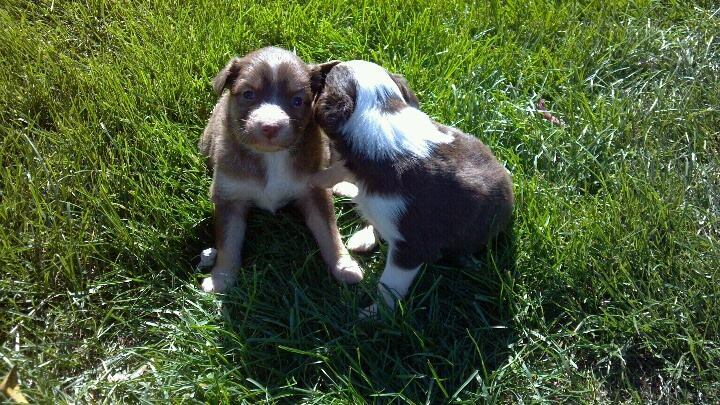 "Want to hear a secret?"